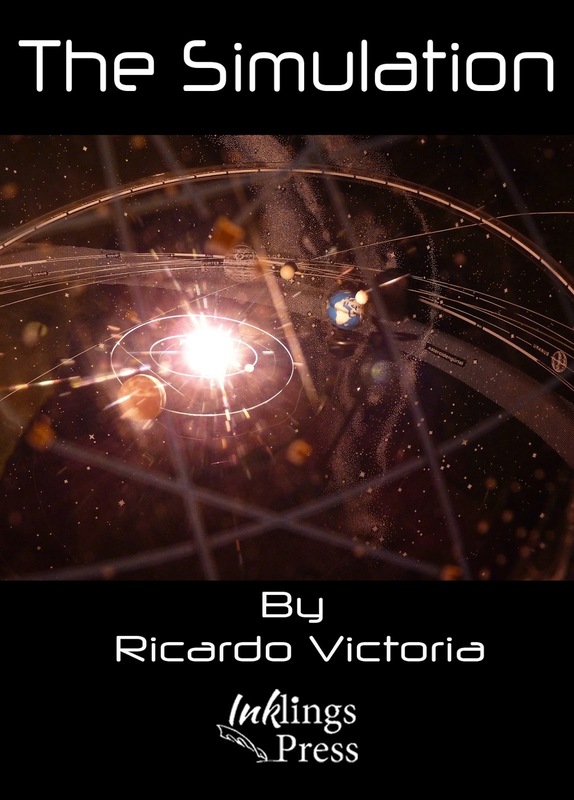 Editor's note: Ricardo Victoria is a familiar face here at the blog - and today he returns with a free story for you to enjoy. A slice of science fantasy, his genre of choice - a fine one, which embraces everything from Edgar Rice Burroughs' Barsoom through Star Wars and Avatar to anime classics such as Akira or videogames like Final Fantasy, combining magic and machines. Speaking of machines, here's one that might be one step too far... Ricardo brings us The Simulation. Enjoy. “I don’t know,” Jay replied with a shrug. He was short and chubby and felt like he hadn’t slept in weeks. “What do you mean you don’t know? This thing didn’t create itself. It is… too complex,” the tall, thin guy said with exasperation. Lou was his name, and he was pointing to a hologram projection. It was a planet, brimming with life, cities, people, animals of different kinds, some vaguely familiar, some brand new to the pair. “You were missing for weeks. It’s clear you were busy coding this. What do you mean you don’t remember doing it? Were you consuming again?” The tall guy gave him a disapproving look. He knew addictions were a sore spot in their friendship. “And to stifle power gaming,” the tall guy added, smirking slightly. “Well, yeah. Things have become… unruly to say the least. Starting with you,” Jay replied seriously. While he liked to tinker with the gaming system, he was getting tired of the players’ power gaming - so much so that their story had become an unwieldy mess recently. Especially thanks to Lou’s mean streak. “And I already apologized for that. Still, I can’t believe you don’t recall coding a perfect simulacrum of our roleplaying setting, down to physics and magic rules, history and the whole set of rulebooks. Heck, you even included a time progression of the family trees of each of our player characters. It has their genetic codes, and are those quantum interactions? Again, how the hell did this happen?” Amazement brimmed in Lou’s voice. “Look, I’m asking the same question. I just remember I started coding, using as a base an old AI template code I found lying around from our school projects. But it looked different,” Jay offered, although he knew that, even for him, the absent-minded genius was a lame excuse. “Different how?” Lou asked, intrigued. Jay stood there in silence, avoiding his friend’s gaze. He already knew the answer but he wasn’t sure how. It was as if it had always been inside his head. “Expansion rate?” Lou asked intrigued. This was getting better and better. “The holographic simulation keeps growing as we speak, see? It’s a self-contained expansion. Like a cubic balloon.” Jay touched a few buttons on the panel control and the display zoomed out from the planet and into a vast space, full of stars, galaxies, clusters, peppering the not-so-empty black void. “I have admin powers, which in this hologram means I can warp reality and create pretty much anything and even go back into its timeline and alter it.” Jay demonstrated, showing how he could rewind the hologram growth. The hologram shrunk in size and then grew back again to its current status. “Really? Why?” Lou sounded surprised. “Here is the powergamer talking,” Jay said, tired. He had the same arguments with Lou time and time again when it came to any of his inventions. Jay was the creative wizard, always creating new things just for fun, to see if it was possible. Like that energy system that worked with just a voice command. On the other hand, Lou was the one always trying to seize the commercial opportunities of such inventions, never stopping to ask if they were actually safe or sound. “Because I’m feeling the same. Apparently, someone is summoning the moderator seeing as the admin is not replying. Man, this dude is basically swimming in blood to get my attention.” Lou pointed, his legs trembling. The tiny supplicant had made quite a mess with a massive sacrifice. “Some of the supplicants can be a bit extreme in their methods,” Jay replied, his head feeling heavy. Jay felt his mind getting scrambled. Lou dropped to the floor next to him, while he was trying to remain standing. A buzzing noise rang inside his head, increasing in intensity. He was bleeding profusely from his nose. Soon, his whole world turned to black and he felt into a deep slumber. “Where are we?” Jay asked when he woke up. Lou was next to him. Both were in an empty valley, with a few patches of green splotched over the place. The sky was intensely blue. More vibrant than any color Jay had seen before. A few clouds floated peacefully away, carried by the wind, while the sun shone brightly. “How can that be?” Jay wondered. He was at a loss. Lou was right, both of them were inside his creation. How they knew that he wasn’t sure. But, inside, he could feel that it was true. He also felt a strange wave of energy inside he never felt before. He was still trying to come to terms with the idea when, out of the blue, Lou flicked his hands and a purple light came from them. In an empty space, from the ground, a structure made of jagged black onyx grew to gargantuan proportions in front of them. It was vaguely reminiscent of the temples back home. “How did you do that?” Jay asked, still slightly dazed. “I just thought it. Want to try it?” Lou offered. His voice sounded filled with excitement. And something else. “Wow!” Jay exclaimed, surprised at the display of power. Then, he pointed to a piece of barren land and, with a flick of his hand, created a whole forest, critters included. “We are inside the game, but we retain admin and mod powers. We are basically gods in this universe!” Lou yelled to the skies, making the ground tremble. Jay felt the power emanating from his friend and it was starting to clash with his own. “Why? It’s not like someone is waiting for us. Here we are gods, we can do what I want,” Lou licked his lips. “What you want?” Jay was confused. “What we want,” Lou corrected himself, but with a tone that left Jay unconvinced. “You sound different,” Jay said, looking at Lou with concern. “I sound like someone who has achieved true potential,” Lou countered. “I’m starting to regret giving you mod powers,” Jay said, pinching the bridge of his nose. This was giving him a migraine. And it reflected on the environment, as clouds brimming with thunder rolled across the horizon. “Not as fondly as you,” Jay sighed. Lou had a competitive streak that bordered on the mean. “What do you say we restart it here, right now? Like the gods we are,” Lou declared, raising his fist. There was something odd in his eyes. Something that worried Jay. “I don’t like the idea. These beings are independent of that game. There are rules for that,” Jay said with a tremor in his voice. “Rules schmules. Let’s have fun,” Lou suggested with a smile that was more menacing than friendly. It sent shivers down Jay’s spine, but he decided to stand up to his friend. “I can’t let you do that,” Jay said. With a flick of his hands, blue energy surged from the environment, enveloping Lou. Jay could see the source code of this reality and was trying to reprogram it, stifling as much as he could the mod rights he had foolishly granted to Lou. “You can’t stop me, the mod rights are permanent. You encoded them into the very source code of the universe. It seems that you are stuck with me, Jay,” Lou replied, waving away the energy that Jay unleashed upon him. “That may be the case, Lou, but it doesn’t mean I won’t try to rein you in until we can get back home,” Jay said. He was getting tired of his friend. He loved him, but at times Lou could be a handful to anyone. No wonder he had few friends back home. Correction, not friends, just acquaintances that barely tolerated him. “Have fun trying that. Meanwhile, I will be busy creating a few new creatures. I like the idea of a seven-headed dragon. See ya, Jay.” Lou said, before walking away, while a shroud of black smoke circled him. Jay grabbed some dirt from the ground and started modeling. Jay breathed upon his creations, seven beings of different gender and even different species. All had wings and held fiery swords. “Almighty Father?” the first creature said, bowing before him, followed by the other six. Jay could only roll his eyes. This was not what he had in mind. “This is gonna be a long stay,” Jay muttered, resigned. He sighed and made a signal for the creatures to follow him. Moving around was easy for him now, as if he were everywhere and nowhere at the same time. He could hear and feel everything, down to the quantum level. Despite being a hologram, it was highly realistic for him now, way too real. Jay feared the whole experience had started to rewrite his own reality to bind him forever to this place. His only hope was that the whole system wouldn’t implode or suffer from entropic degradation before he could get himself and Lou out of there. And the key, he suspected, lay in their avatars, their “children”. “Let’s go and find that son of mine,” he ordered. Creating a whole new reality and getting stuck inside it wasn’t as amusing at it first seemed. This is brilliant! 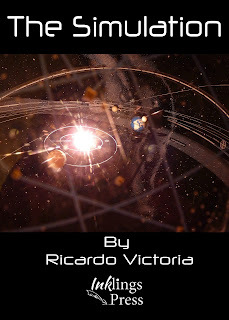 Ricardo Victoria is a very talented Science Fantasy author. He should consider sending in a submission for the new SciFan Magazine. Man's got skills, hasn't he? I do enjoy his stuff. And hey, Richard, if you want, can happily send you a copy of the Tales of Wonder collection for a read. And sometime you're welcome to feature back here again for a chat about the magazine.